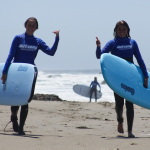 Every summer WB Surf Camp provides the surfing opportunity of a lifetime for both beginner and advanced surfers! Our very exclusive Overnight California Teen Surf Camp is a 14-day program that heavily immerses our campers in the iconic surf culture of the West Coast. This unique program will take you away from the crowds, traveling all along the famous central coast, home to numerous world-class breaks and an amazingly diverse marine environment. 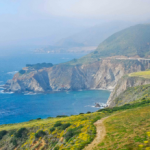 We will be traveling the California coast starting at the Monterey Bay Aquarium and will be cruising our way down to the Santa Barbara Channel while staying in cabins and camping in tents all along the way. This summer camp is designed for beginners with no prior surfing experience, while intermediate surfers will be able to further hone their surfing prowess in the water. You will be individually coached by our professional staff using our proven teaching methodology which will help our campers develop a strong base of surfing fundamentals, regardless of experience. Fortunately,there are so many breaks that are suited to different levels of surfing that it allows us to accommodate everyone’s surfing ability. Not only does this camp provide a rich surfing experience, but we also participate in a variety of fun and diverse non-surfing activities. Though we will be in the water for a majority of the trip, we have designed this program all around fun, adventure, and experiences in and out of the water. Campers will have the opportunity to visit the famous Monterey Bay Aquarium and Pacific Wildlife center, as well as a trip to the Santa Cruz Surf Museum and the prestigious Channel Islands Surf Shop. Our campers will have the opportunity to earn 10 credits of community service working alongside The Morro Bay National Estuary Program. We also take our campers on an adventure of a lifetime as we hike, bike, and kayak all along the incredible areas of Morro Bay and Santa Barbara! Travel to the state that helped revolutionize the sport and learn to surf in the wake of legends. 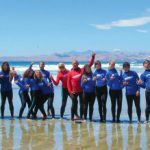 We are confident that this camp will provide you the tools to continue a lifetime of surfing and ocean exploration! Spots are limited for this all-inclusive California adventure, so don’t waste any time and sign up today! Find more program details and how to enroll HERE. The adventure begins July 22nd.